SYNTHWARE modified evaporation single neck flask with a standard taper outer joint. Low profile design sits upright on bench and also provides for easy product access with a spatula. 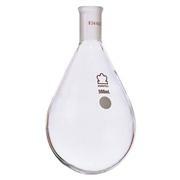 Flask shape is excellent for the controlled evaporation of foaming solvents such as toluene or xylene on a rotary evaporator. SYNTHWARE recovery/evaporating, heavy wall, single neck flask with a standard taper outer joint. Desined for easy recovery of reaction products and for use with rotary evaporators. All sizes are hand blown from tubing to ensure uniform wall thickness. Borosilicate glass receiving flask for all large scale rotary evaporators. Available in safety coated or plain glass. Side neck includes a SVL thread vent cap. Bottom inner ball joint includes CAPFE o-ring. Dark amber coated glass version is also available. 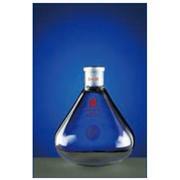 A multipurpose, round bottom flask with a single neck and sloping side wall. Designed for use as a recovery flask with rotary evaporators. Heavy wall product family members feature approximately 30% heavier wall weights. Replacement drying flask for Buchi rotary evaporators. Pear shaped heavy wall with a standard taper single neck. Available plain or safety coated. 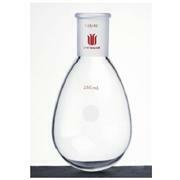 Replacement flask for Buchi rotary evaporators. 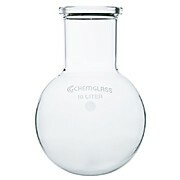 Round bottom flasks with a 35/20 single neck and safety coating. These PYREX® traps are used in rotary evaporators. They have a round body with upper and lower stems. The lower stem has a Standard Taper inner joint at the bottom and extends upward inside the body. The closed top of this stem has two side openings. The upper stem has a Standard Taper outer joint. 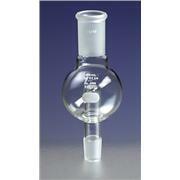 Graduated, round bottom receiving flask for use with all rotary evaporators. 35/20 spherical outer joint will also mate to 35/25 ball joints. 250ml & 500mL size graduated in 10ml increments, 1000ml & 2000ml in 100ml increments. Replacement evaporator flask for Buchi rotary evaporators. Pear shaped heavy wall with a standard taper single neck. Safety coated. New design jacketed receiving flask. Fits all rotary evaporators. Outer jacket has 28/15 o-ring ball joints to seal to chiller hoses. Has an SVL thread vent cap on side joint. Bottom DN25 ball joint has CAPFE o-ring. Jacket inlet and outlet ball joints have FETFE o-rings.